81.11 STATUS OF MANCHURIA (MANCHUKUO): The Japanese conquest of Manchuria began in 1931 and was more or less completed in 1933. The Japanese establishment of the puppet state of Manchukuo was not recognized by many countries. While Manchuria legally may have remained part of China, for game purposes it is considered a Japanese colony worth 20 BRPs and is not considered part of China for any purposes. 81.21 HARBIN AND MUKDEN: Harbin and Mukden are both considered capitals of Manchuria. Each is a key economic area worth 10 BRPs. 81.31 MANCHURIAN GARRISON: Japan begins all scenarios with 45 BRPs of units (two 2-3 and two 1-3 armor units; three 3-2, three 2-2 and three 1-2 infantry units; and five AAF) in Manchuria. The exact unit types indicated must be present. 81.32 USE OF MANCHURIAN UNITS: Manchurian garrison units may be used without penalty, although a reduction in the size of the Manchurian garrison, including the inversion of Japanese army air units in Manchuria after their use and subsequent redeployment, permits Russia to withdraw comparable units from its Siberian garrison (81.42C) and may allow a Russian declaration of war on Japan (81.51B). The ZoC of Japanese armor units in Manchuria extends beyond the borders of Manchuria into Chinese and Korean territory. 81.33 PACIFIC SCENARIOS: In Pacific scenarios, Japan may remove 15 BRPs of units from Manchuria for use elsewhere in Summer 1941 or the turn in which war breaks out between Britain and Japan, whichever comes first. The remaining units must remain in Manchuria to defend against a Russian attack. 81.41 SIBERIAN GARRISON: Russia begins all scenarios with 45 BRPs of units (two 3-3 armor units; two 3-2, four 2-2 and four 1-2 infantry units; and five AAF) in Siberia. The Siberian garrison may be placed in Siberia, Mongolia and Tannu Tuva. A. WAR WITH GERMANY: Russia and Germany are at war. B. OIL EMBARGO AGAINST JAPAN: The U.S. has imposed an oil embargo on Japan. C. JAPANESE REDUCTION OF MANCHURIAN GARRISON: Japan reduces the size of its Manchurian garrison, which it may do at any time. The size of the Japanese Manchurian garrison is determined at the start of the Russian player turn. Russia may then transfer equivalent forces of the same type from Siberia to Europe, subject to the minimum Siberian garrison requirement of 30 BRPs of units, including one Russian three-factor armor unit (81.43). Armor fractions are rounded in favor of Russia: if Japan has fewer than six armor factors in Manchuria, a Russian 3-3 armor unit may be transferred to Europe. The substitution of one type of Japanese unit for another is insufficient; Japan must have five uninverted AAF, six factors of armor and 18 factors of infantry in Manchuria at the end of its turn to prevent Russia from transferring forces from Siberia to Europe. Specialized units and uninverted land-based NAS are counted when determining the BRP value of the Manchurian garrison, but do not prevent Russia from transferring forces from Siberia to Europe. EXAMPLE: In Spring 1941, Japan reduces the size of its Manchurian garrison by three infantry factors. Russia may transfer three infantry factors, of any type, to Europe. If Japan had removed one, two or three armor factors from its Manchurian garrison, Russia could transfer a 3-5 armor unit to Europe. 81.43 MINIMUM GARRISON REQUIREMENT: Until Russia and Japan have gone to war, Russia may not reduce the Siberian garrison to less than 30 BRPs of units and must keep one Russian three-factor armor unit in Siberia. A. JAPANESE DECLARATION OF WAR ON RUSSIA: There are no restrictions on when Japan may declare war on Russia. 81.52 DETERMINING GARRISON SIZES: The sizes of the Siberian and Manchurian garrisons are calculated whenever Russia wishes to declare war on Japan. Inverted air units, carrier-based naval air units and naval units are not counted when determining the BRP value of the Siberian and Manchurian garrisons. 81.53 BRP COST: A Japanese and Russian declaration of war on the other costs 35 BRPs. 81.61 THE URALS BOX: The Urals box represents that part of Russia which does not appear on either mapboard. 81.62 BASING: The Urals box has an unlimited basing capacity for Russian air units. A. EUROPE: Any hex in Russia on the eastern edge of the European mapboard (A62-Z53). 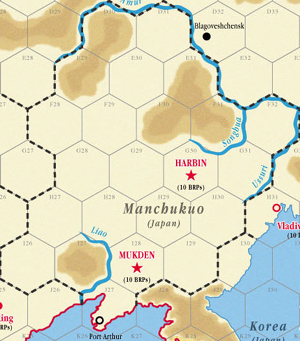 B. PACIFIC: Any hex in Russia (A23 to F18) or Communist China (initially G18 to L15) on the western edge of the Pacific mapboard. A. GROUND UNITS: By moving through one of the hexes listed in 81.63A and B. B. AIR UNITS: By staging through one of the hexes listed in 81.63A and B. A. ARMOR UNITS: By exploitation movement through one of the hexes listed in 81.63A and B. A. By TR or SR through one of the hexes listed in 81.63A and B. 81.634 AXIS UNITS PROHIBITED: European Axis and Japanese units may not enter the Urals box (EXCEPTION: Bombing - 26.462). 81.64 AIR OPERATIONS: The only offensive air operations permitted into the Urals box are Axis and Japanese bombing. Air combat between Axis or Japanese air units which are bombing the Urals box and Russian air units in the Urals box is resolved normally. For offensive operation purposes, the Urals box is considered part of the eastern front (Axis bombing) or the Asian front (Japanese bombing). Air attacks against Russian air units in the Urals box are prohibited. 81.641 BOMBING EFFECTS: For every three BRPs lost as a result of Axis or Japanese bombing or flying bomb attacks against the Urals box, the Russian construction limit is reduced by one BRP. For every one BRP lost as a result of Axis or Japanese rocket attacks against the Urals box, the Russian construction limit is reduced by one BRP. The maximum reduction in the Russian construction limit each turn is 15 BRPs. 81.65 LEAVING THE URALS BOX: Russian units in the Urals box may move, stage or redeploy onto the board. Russian ground units moving out of the Urals box may enter vacant enemy-controlled hexes listed in 81.63A and B on the edge of the mapboard, provided this does not result in there being fewer Russian ground factors in the Urals box than there are European Axis and Japanese ground factors adjacent to the Urals box in the hexes listed in 81.63A and B. 81.66 AIR MISSIONS: Axis air units may not fly missions into the Urals box (EXCEPTION: Bombing - 26.462). Russian air units in the Urals box may not fly missions onto the mapboard. 81.67 GROUND ATTACKS: Ground attacks from the Urals box onto the mapboard, or from the mapboard into the Urals box, are prohibited. 81.68 ATTRITION: The Urals box and all adjacent European attrition zones are considered to be a single attrition zone. Similarly, the Urals box and all adjacent Pacific attrition zones are considered to be a single attrition zone. Axis and Japanese ground units adjacent to the Urals box may attrition, and be attritioned by, Russian ground units in the Urals box. Hex results achieved in attrition combat solely against the Urals box have no effect, nor can Russian ground units capture hexes by attrition advance from the Urals box. No offensive operations involving ground units are permitted in the Urals box. 81.71 RUSSIAN BRPs: For each European Axis or Japanese ground factor adjacent to the Urals box in excess of the number of Russian ground factors in the Urals box at the end of the Axis combat phase, Russia loses one BRP, up to a maximum of 15 BRPs per turn, provided Russia is at war with the European Axis or Japan, as the case may be. 81.72 RUSSIAN CONSTRUCTION: For every three Russian BRPs lost because of European Axis or Japanese ground factors adjacent to the Urals box, the Russian construction limit is reduced by one BRP, up to a maximum of 15 BRPs. The limits on the effects of bombing and rocketing the Urals box and having Axis units adjacent to it are cumulative. The Russian construction limit may be reduced no more than 15 BRPs per turn from all three causes.